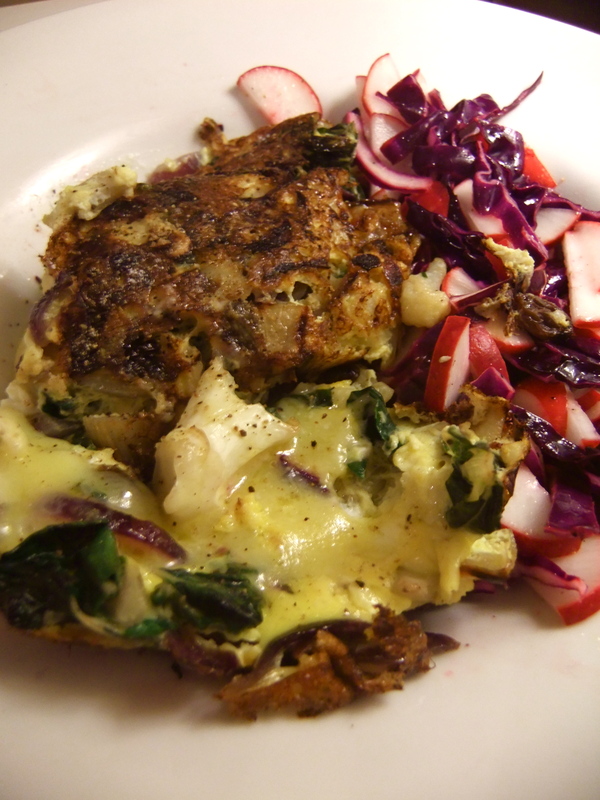 Anyway, to celebrate my first Bay Area Spring, the blooming cherry blossoms and my CSA, I made this happy, little swiss chard frittata and radish-red cabbage salad. I’m not sure I’ve ever had swiss chard before—I’ve definitely never cooked it. If I end up hating CSA, at least I’ll have learned one thing: I LOVE swiss chard: it has crunch, major flavor and serious BITE. 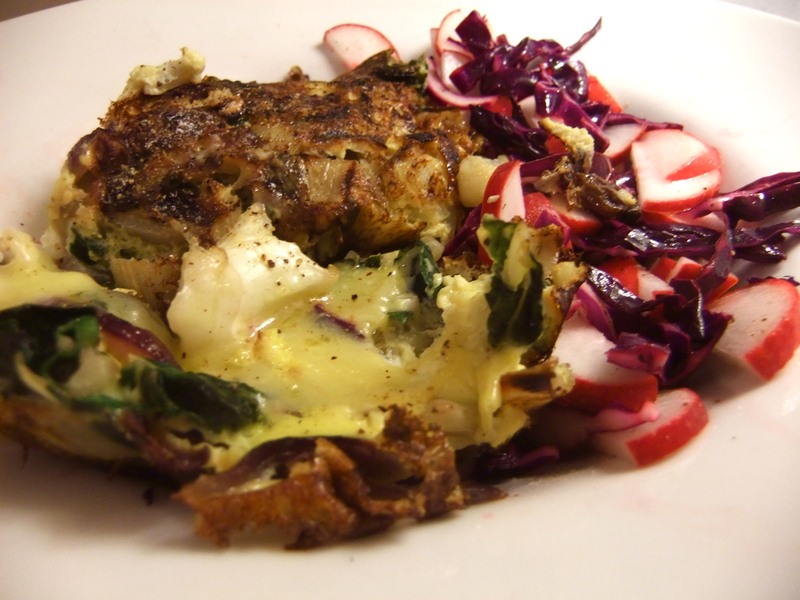 And it tasted incredible in my little ode-to-Spring omelet with sauteed garlic, onion, cauliflower, raisins and shredded sharp white cheddar. For the side salad, I sliced up some radishes and red cabbage and tossed them in a simple lemon-olive oil vinaigrette (because balsamic would’ve been too much). In a small, non-stick pan on medium-low heat, saute the swiss chard, garlic, onion and cauliflower in a little olive oil (ca. 5 minutes). Once the vegetables have softened a bit, add in the raisins, salt and pepper. Stir and allow to brown slightly. Reduce the heat to low. Pour in the whisked egg-milk mixture and evenly distribute it in the pan. Cover and allow to cook/steam for 3-5 minutes (or until the egg is half-set). While the frittata is cooking, prepare the salad: In a small salad bowl, mix together the lemon juice, olive oil, sugar, salt and pepper. 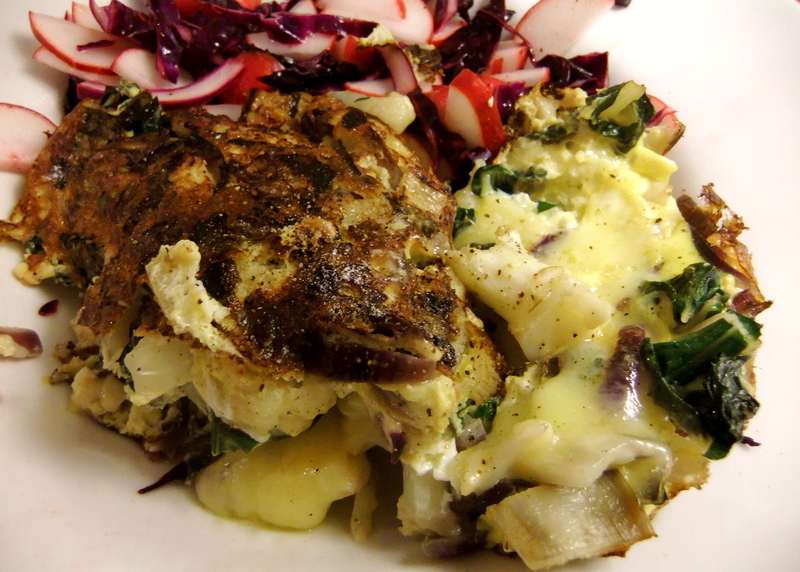 Toss in the sliced radishes and shredded red cabbage. Mix and set aside. Check on the frittata: If the egg is half-set, remove the cover, sprinkle the shredded cheddar over the top. Cover again and cook until the egg is set and the cheese is melted (ca. 3 minutes). Sprinkle a little more salt and pepper and a squeeze of lemon juice over the top. Serve. I’ve been eating a lot of red cabbage and cilantro these past few weeks. For two reasons: they’re totally budget-friendly (1 head of cabbage and 1 bunch of cilantro lasts me an entire week) as well as figure-friendly, or at least that’s what my mom and sister say. They both swear they’ve lost inches off their waistlines just by replacing lettuce with cabbage. Save money AND lose weight? Sounds good to me. This salad was so awesome. 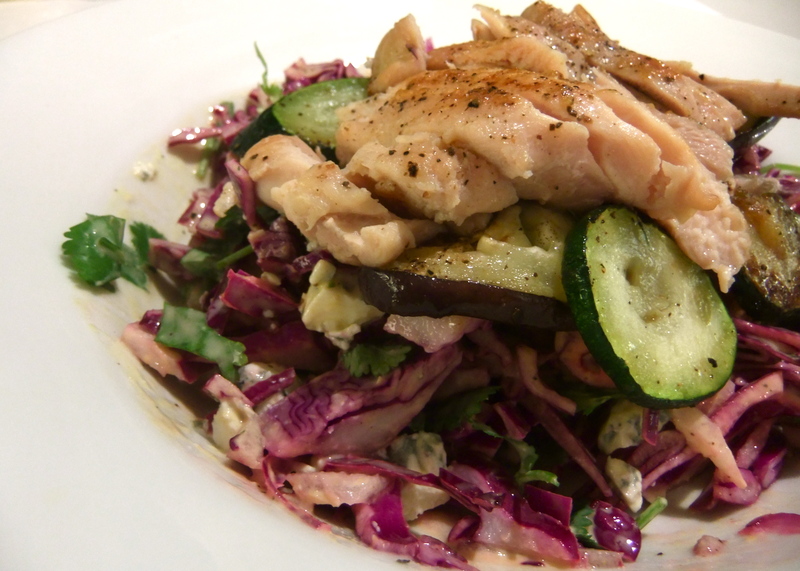 Super crunchy from the red cabbage, kicky from the cilantro and sweet from the dressing. I made the dressing with non-fat greek-style yogurt instead of mayonnaise, and I sauteed the chicken thigh, eggplant and zucchini in only a drizzle of olive oil. So fat content is pretty minimal as well. You can of course play around with ingredient combination. I use canned tuna a lot or go completely vegetarian and use sweet potato instead. Put the sliced zucchini and eggplant in an unzipped Ziploc bag and microwave for 1 minute. Remove and set aside. In a pre-heated non-stick skillet, fry the chicken thigh in a little olive oil, ca. 2 min. Do not move or flip during this time. Grind salt and pepper over the top. Then, flip the chicken and push to the side. Put in the zucchini and eggplant. Grind a little salt and pepper over the vegetables and other side of the chicken. Fry for about 2 minutes, moving the vegetables around to ensure even browning. Turn off the heat and let sit for a few minutes while you prepare the salad and dressing. In a medium-sized salad bowl, combine and mix together all dressing ingredients. Add the chopped onion, cabbage, cilantro and crumbled blue cheese and toss to coat. Slice the chicken at an angle. 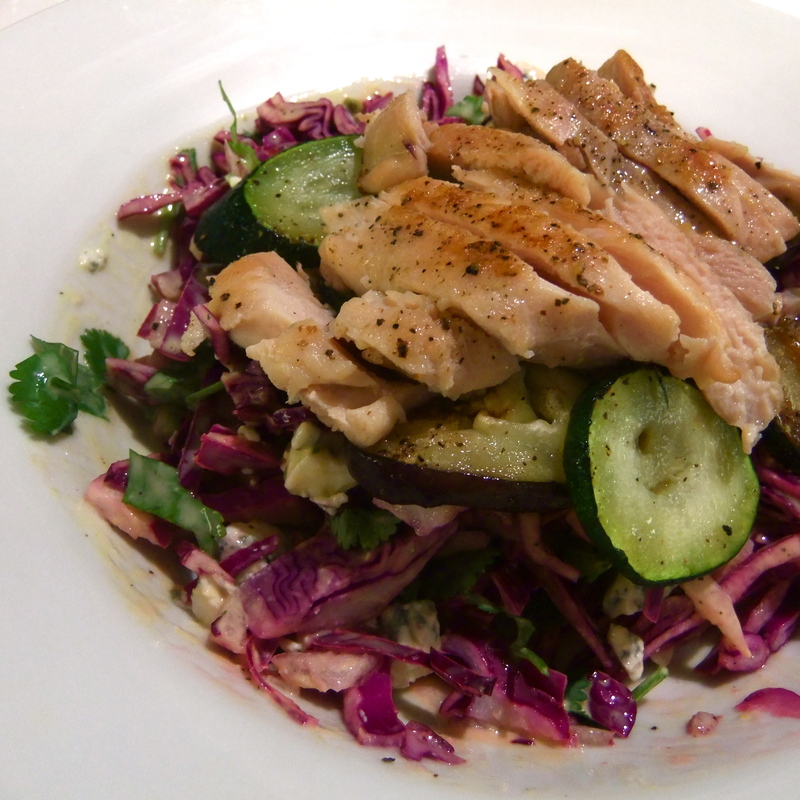 Put the salad on a large salad plate, topping with the sauteed veggies and sliced chicken. Grind a little more salt and pepper over top.